I love to cook. I normally make healthy, low-calorie veggie dishes and love experimenting with fresh herbs. However, I have my moments of weakness. You see, I grew up in a family where everyone, it seemed, had their own special dish which would be requested at every family gathering from Christmas Eve to a weekend barbecue. I am 50% Polish and grew up in the same home as my Polish grandparents. Chruscik, Paczke, Babka, Bigos and Borscht made it to the main table at every important meal. (And, of course Golumpki and Potato Pancakes!) I don’t have a big family anymore, and for Christmas this year, it was just my Husband and I, cozied up in our little townhouse with our two cats. Who, incidentally, could care less about Christmas…other than the fact that they get extra table scraps, such as ham, turkey and in Spike’s case, green beans. Yes, one of my cats eats green beans, the other is an adrenaline junkie who goes crazy over chocolate…Ghirardelli and peanut butter Hershey’s Kisses are his favorite. I have the perfect mix of feline companions: One for when it’s that special time of the month, when all I want is chocolate and something fuzzy to cuddle, the other for when I decide I’m on a diet. I wanted to do something special this year, it being our last in Alaska. I decided to make one of my favorite recipes from my childhood, my Grandmother’s Wild Mushroom-Barley Soup. I don’t want to butcher the name, but I believe it is called Zupa Gryzbowa. Please correct me if I’m wrong. Anyway, on Christmas Eve, I prepared the recipe for my Husband, who gobbled up two bowls and asked for more an hour later. I had never attempted this soup before, although I knew the ingredients and flavor by heart. First try and it turned out amazing! Such a proud moment. Not really in the mood to spend the ENTIRE day in the kitchen, we bought frozen pierogi to go along with the soup. Let me tell you something, frozen pierogi are a mortal sin. 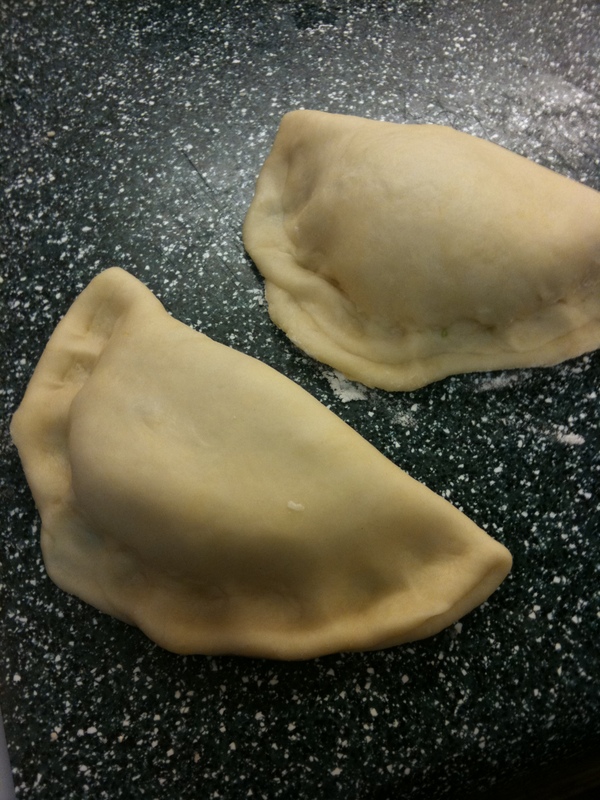 Sure, they’re quick and convenient, but they are NOTHING AT ALL like the homemade pierogi I have so often enjoyed, stuffed with the flavor of fresh, buttery fried onions and sealed with a line of tiny fingerprints. Finally consuming the last of the evil, bland, frozen pierogi wannabes last night, I vowed to dig up my grandmother’s recipe and prepare a batch of pierogi the way they’re supposed to be done. I kneaded up a heap of sour cream dough, mashed a pot of potatoes, fried a pan of onions and cabbage and pulled the leaves off an entire handful of dill. An hour later, my Husband drooled into his iPhone as I described the wonderful fragrance wafting through our kitchen. He won’t be home for another three weeks, but I am definitely preparing these for him upon his return. I only finished cooking them an hour ago and have already eaten five. That is probably 3/4 of my calories for the day and enough carbs to last until June, but oh, they were SO worth it! Please allow me to introduce myself. My name is Suzy, what’s yours? Well, nice to meet you, No Response! Now that we’re acquainted (and I’m wildly overjoyed that I spelled acquainted correctly), I’d like to tell you a bit about myself. I started “blogging” via my first website, Insanity Alley, well over ten years ago. I just wanted a place on the web where I could entertain others, give advice, rant and rave to my heart’s desire and display some of my poetry and artwork for all the world to see. It wasn’t called blogging back then, and simple things like adding an image to a web page took much more effort and time than it will take me to write this entire post. Ah, those were the days! Since then, I have (at one point or another) maintained numerous blogs, webrings, forums, social networking pages, internet shops and who knows what else. I love it and have no plans to stop anytime soon. Also, as I’m sure you’ve noticed, I use a lot of (annoying) parenthesis when I write. And yes, I also spelled parenthesis correctly on the first try. I’m a pretty smart girl but that won’t stop me from using parenthesis, improper grammar or saying something outright stupid every once in a while, but that’s all part of the fun. Isn’t it? …You’re still here? You’re still reading? Looking for more, aren’t you? Well alright, why don’t you go clicky-click on the pretty pictures on the side of this page? That will take you to my Flickr photos. They’re nice if you like landscapes and Alaska and kitties being adored and/or unnecessarily humiliated. Enjoy!